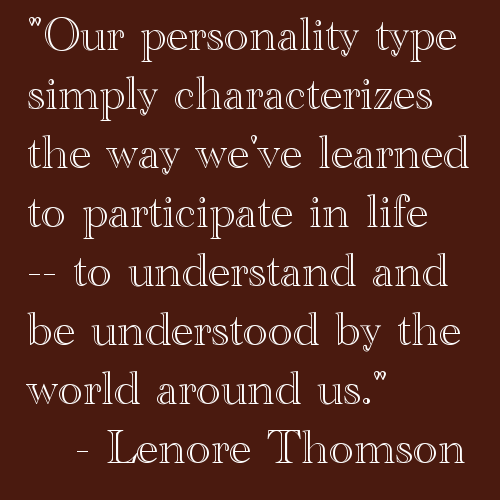 I've just started reading a book by Lenore Thomson called Personality Type: An Owner's Manual. She does an excellent job of explaining what personality types are. The following is from page 23 of 1998 hardback edition of the book. "...our type does not define who we 'really are' any more than using a particular language defines the nature of the soul. 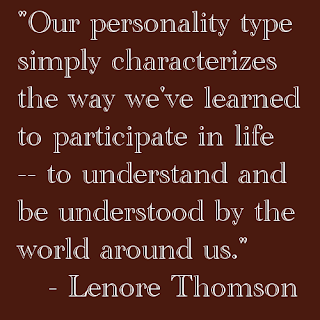 It simply characterizes the way we've learned to participate in life -- to understand and be understood by the world around us. "Nature equips us in most spheres with more potential than we can actually develop in a lifetime. We are born with a broad range of adaptive possibilities. For example, every infant -- from China to Mexico to New Guinea -- babbles in exactly the same way, using every sound that occurs in every language spoken on earth. It's only as we begin to imitate the sounds we hear around us that certain linguistic combinations become reinforced and others are set aside. If we attempt to learn another language later in life, we can usually recover some of that sacrificed potential. But we may find it difficult to lose the accent derived from our native language. "So it is with the typological functions. Although we are born with the capacity for many different combinations, we adapt to our environment by developing only one or two -- usually the ones that come easiest to us, modified by opportunity and social expectation. The process is very much like becoming fluent in a language. When we've developed a particular was of interacting with the world, we tend to use other, less-developed functions with something like a behavioral accent."